Find out how to keep your child safe by integrating security measures within your child’s Individualized Education Program. 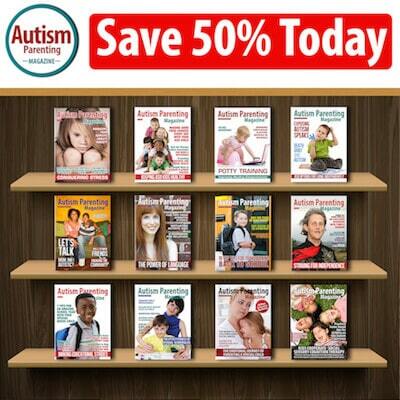 Discover simple ways you can help your developing child with autism master skills needed throughout puberty. Learn tips from a licensed psychologist on ways to help your child with autism safely form genuine relationships. Discover what children with autism like most about Minecraft and the private server Autcraft and why connecting with other people is important. A mom lovingly shares a snapshot of what autism looks like for her charming young son. Find out in an interview with expert Matthew Fisher, MD, how some people with autism commonly experience other medical conditions that can sometimes mask or even exacerbate symptoms of autism. Discover ways you and your family can address sleep hygiene and create a framework for deep and consistent sleep. Learn special points to consider when putting together an exercise program to ensure a safe and successful exercise experience. This article is the second in a series. Read the moving story of a young man with Asperger’s syndrome who, with the help of family, overcame obstacles and reached his goals. Receive expert advice on creative ways to make bath time more enjoyable for children with autism. Learn thoughtful ways to help children with autism better understand and process death, especially when it involves someone close to them. Meet a 13-year-old artist who fashioned a special dress to develop autism awareness. Learn ways an occupational therapist can help children develop the skills necessary to grow and thrive. A man on the autism spectrum reviews several studies on autism and gender and shares the flaws he suspects in recent research. The mom of a busy toddler with autism shares what it’s like when people who don’t understand autism meet her son. Utilizing life experiences, author Aaron Parker provides a frankly honest, hugely informative look into life on the autism spectrum. Learn how one mom found a special connection with her son by encouraging his creative mind—and joining him there. Find advice on proactive and reactive ways to manage challenging behavior with autism before a meltdown occurs. Learn about a special boxing program that helps children with autism develop confidence and show them they are not alone. Using a menagerie of animal friends and a young boy with autism, author Marie Unanue has produced a unique book for kids about kindness, character, and overcoming obstacles. Learn about an innovative full-featured scheduling tool used to help organize and structure daily life for people of all ages. Take a look at a remarkable book written by Kimberly Reeves, MEd, and Ryan Cunningham as they provide a story of compassion, hope, and insight that will assist families in navigating life with autism. An author and motivational speaker interviews a dynamic book author and mother of a child with autism who serves in bi-vocational church leadership and acts as a special needs ministry consultant. Learn how an act passed in 2014 has opened the door for young people with disabilities. What worries you most as the parent or caregiver of a child on the autism spectrum? Is it finding appropriate therapies for your child? Is it securing a positive and safe educational environment? Are you up late at night worried about your child’s future? Do the day-to-day challenges of autism overwhelm you? Well, you’re not alone. Special needs parenting stress is real. In fact, a study completed several years ago by researchers at the University of Wisconsin-Madison revealed mothers of children and adults with autism experienced stress comparable to combat soldiers. This is likely true for many caregivers. 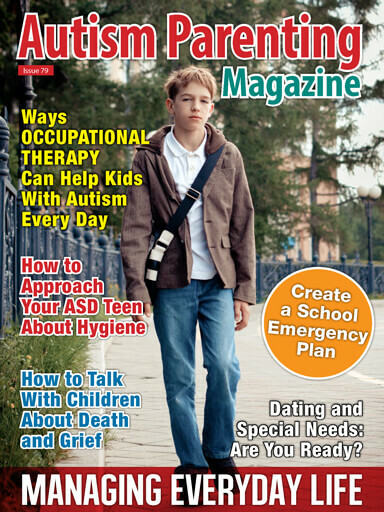 In an effort to help reduce these daily stressors, this month’s issue focuses on ways to manage daily life when someone you love has autism. Take a look at our top ways to handle day-to-day tasks—from making bath time a positive experience for you and your child to creating a sleep-hygiene framework for deep and consistent sleep. We also feature articles exploring new ways to develop social skills through monitored computer games, as well as special points to consider when developing an exercise program for your child. School and daycare safety also play important parts in daily life, especially during these modern times. Many facilities have emergency plans in place that include preparations for acts of violence, but keep in mind the school or daycare may not have adequately measured the very specific needs of your child. The good news is these types of considerations can be included as you develop or update your child’s Individualized Education Program (IEP). To learn ways to keep your child safe by integrating security measures, please take a look at the piece Ways You Can Use the IEP to Create the Best School Emergency Plan written by Sandy Fields, BS. Do not assume your school has thought about what your child needs in an emergency—and don’t be afraid to ask questions and secure a plan. Finding ways to help a child with autism deal with the loss of a friend or relative is another top concern with many of our readers as understanding death and grief isn’t easy for some. For expert guidance, we connected with the authors of the children’s book I Have a Question About Death Arlen Gaines, MSW, LCSW-C, ACHP-SW, and Meredith Polsky, MSW, LCSW, MS Special Education. Take a look at their piece How to Talk With Children With Autism About Death and Grief for straight-forward tips to help young people handle this often difficult topic. We’ve had several readers mention the need for some extra help in surviving the teenage years often made more challenging with autism. We are pleased to share Top Advice on How to Approach Your ASD Teen About Hygiene written by single mom Kimberly Reeves, MEd, who notes she was caught by surprise scrambling to create strategies to help her son navigate puberty. Kimberly’s guidance on ways to help developing teens with autism master good hygiene habits is valuable for everyone. What about dating? Is your teen with autism ready for a more serious relationship? Are YOU prepared? Even if your child is too young to date, take a look at the professional advice of Rachel Bédard, PhD, this month as she shares tips on ways to help your child with autism form genuine relationships. Rachel does a terrific job reviewing some of the expectations of dating and the red flags, and even provides some safety reminders in Dating and Special Needs: Are You Ready? We are proud of the autism community that has developed over the past six years and are thrilled to have grown to more than 171,000 Facebook followers. In an effort to further connect with the autism community, we recently launched a page called Autism Support Groups for Families which provides a place to share experiences and advice, and to connect with other families. All voices need to be heard, so please join us. We especially value the many perspectives our contributors bring. Take a look at our collection of personal narratives and poetry this month for some daily inspiration. Kevin Reilly, for example, provided us with a piece called Outrunning Asperger’s: A Father’s Story of Love and Support, a moving story of a young man with Asperger’s syndrome who, with the help of family, overcame obstacles to reach his goals. Heather Wells, the mother of three whose youngest is on the autism spectrum, shared her piece, What Autism Is to Me, in which she provides a loving snapshot of what autism looks like for her family. And Ariela Taub’s poem, To Me, is a lovely tribute to her amazing little girl with autism. We would like to take a moment to thank both our devoted writers as well as our subscribers for coming together to create such a special autism community. Wishing everyone stress-free days ahead.